Did you know, our tablecloths are perfect for outdoor dining? They are extremely practical because they’re shower-proof, plus you can opt to have a parasol hole cut into your chosen tablecloth design, so it will fit your table to perfection. 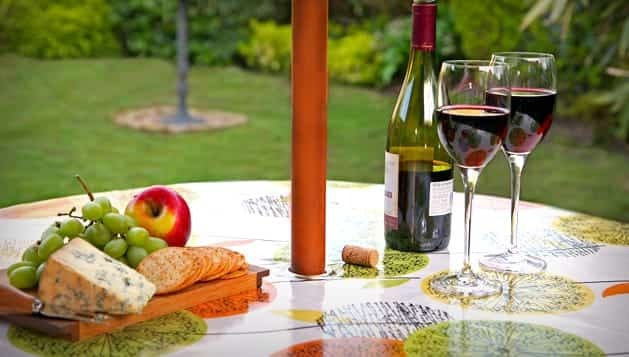 So whether you’re hosting a family barbeque, organising a village fete or running a café, a Wipe Easy tablecloth will look good outdoors and require minimum maintenance. Our tablecloths are made-to-measure so whether you have a round, square or oblong table, we can provide the perfect fit. Take a look at our guide to measuring your table before you place your order. If you have a particularly large table you may need to look at the designs which are available in wider widths - these are labelled on our website. If you’re going to use your tablecloth outdoors, it’s a good idea to invest in a few table clips. These simply clip onto the edge of your table and keep your wipe clean or PVC tablecloth in place. Lots of customers buy our PVC tablecloths to use in their gardens. However, we also supply wipe clean tablecloths to businesses too. Shops, cafes, pubs and restaurants all use our PVC tablecloths as they look good and are highly practical. Please get in touch to discuss your requirements, or browse our range.